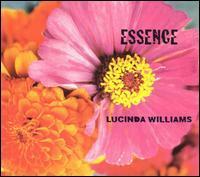 Essence is Lucinda Williams' sixth album. It was released in 2001 (see 2001 in music). The album debuted on the Billboard 200 at number 28, selling about 44,500 copies in its first week. According to Billboard in February 2008, the album has sold 336,000 copies in the U.S.
3. "I Envy the Wind"
9. "Get Right With God"
10. "Bus to Baton Rouge"
Lucinda Williams (born January 26, 1953) is an American rock, folk, and country music singer and songwriter. She recorded her first albums in 1978 and 1980 in a traditional country and blues style and received very little attention from radio, the media, or the public. In 1988, she released her self-titled album, Lucinda Williams. This release featured "Passionate Kisses," a song later recorded by Mary Chapin Carpenter which garnered Lucinda her first Grammy (Best Country Song, 1994). Known for working slowly, Lucinda recorded and released only one other album in the next several years (Sweet Old World in 1992) before her greatest success came in 1998 with Car Wheels On A Gravel Road. This album presented a broader scope of songs that fused rock, blues, country, and Americana into a more distinctive style that still managed to remain consistent and commercial in sound. It went gold and earned Lucinda another Grammy while being universally acclaimed by critics. Since Car Wheels, she has released a string of albums that have also been critically acclaimed, though none have sold in the numbers of her 1998 breakthrough. She was also named "America's best songwriter" by TIME magazine in 2002.